iSkysoft Data Recovery for Mac is a safe and affordable tool which can help you to find back deleted or lost data including but not limited to videos, images, audio files, emails and office documents. It can be used to solve the problem of data loss in different scenarios, no matter you want to recover data from emptied trash, restore data from lost/corrupted partitions, and find backdata from formatted/corrupted storage devices or other unexpected wrong operations, there is no doubt that iSkysoft Data Recovery for Mac is the tool you need. This is professional software which uses the latestpowerful scanning algorithms, its “Quick Scan” and “Deep Scan” features meet your different needs.You can choose the “Deep Scan” mode toincrease the data recoverysuccess rate by scan deeper in the entire file system. 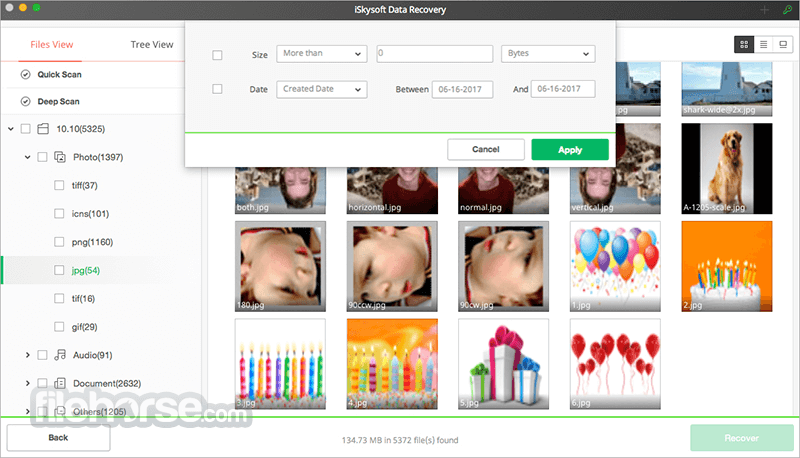 Finally, you can recover your lost data with its original name and quality. 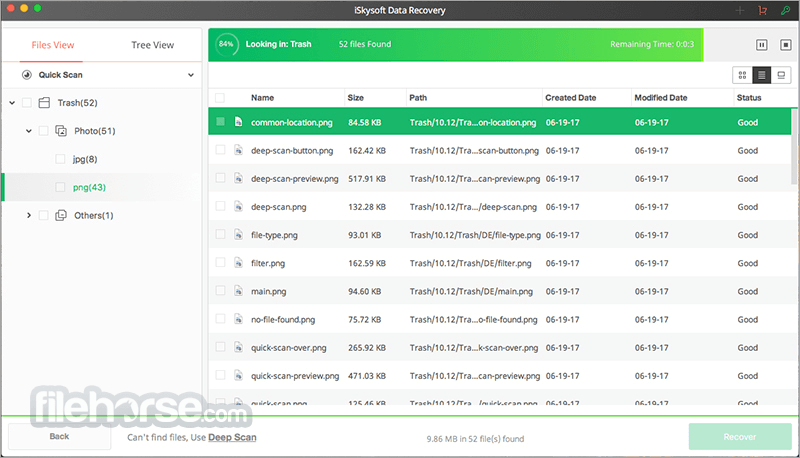 Firstly, try to download and install iSkysoft Data Recovery for Mac on your Mac, launch it and select the file type of your lost data from the main window. Click “Next” button to enter the window to choose the location or path where you lost your data. Then start scanning process, after the default “Quick Scan” process, you can also use “Depp Scan” as you want. After scanning process, filter files from the results and preview them, choose the wanted file to recover to your device. 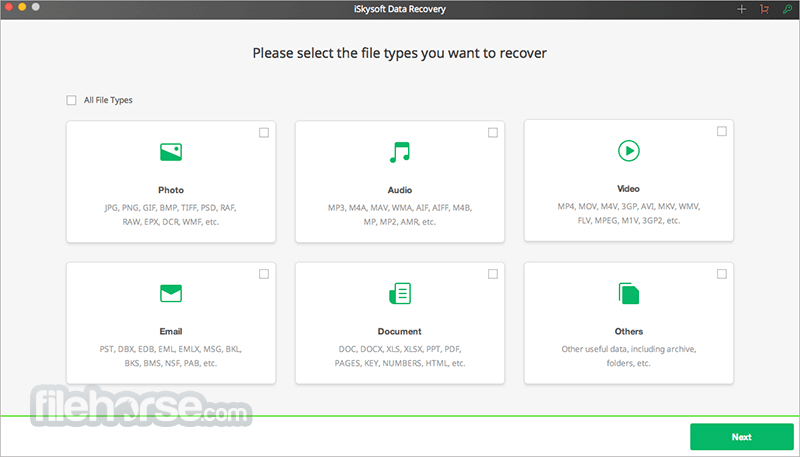 iSkysoft Data Recovery for Mac supports to recover lost/deleted data from Macbook, iMac, hard drive/SSD, iPod, MP3/MP4, USB flash drive of different brands, various memory cards, etc. This mac data recovery tool can recover 550+ formats of files, the file types include images, audio, videos, folders, emails, documents, archives etc. You can use iSkysoft Data Recovery for Mac to scan your device in depth, also you can feel at ease that it is real-only process and it won’t save or use any of your data. 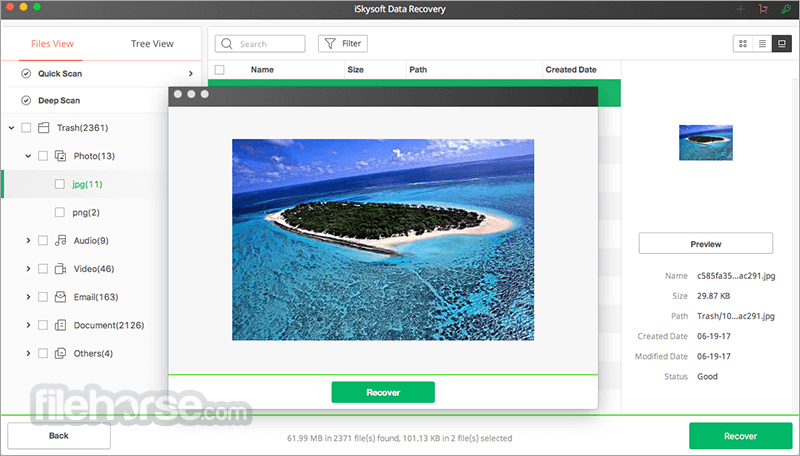 Take into account both speed and data recovery success rate, this tool will do the best to help you retrieve data. Before recover the data, you can try to preview the data to check its contents and quality, and thenyou can choose the valid files to recovery. Usually you just need 3 steps to complete the recovery process. They are file types and path selection, scanning process and one-click recovery. JPG, PNG, TIFF, TIF, PSD, BMP, GIF, RAW, CRW, ARWCR2, NEF, ORF, RAF, SR2, DCR, DNG, MRW, ERF, AI, XCF, DWG, X3F, etc. MOV, AVI, MP4, 3GP, M4V, 3G2, MXF, MKV, WMV, FLV, SWF, MPEG, ASF, MPG, RM(RMVB), etc. MP3, M4A, WAV, AIF, AIFF, WMA, MID, OGG, MIDI, AAC, MP, MP1, MP2, M4B, AMR, CWP, DVF, etc. PDF, PAGES, NUMBERS, DOC, DOCX, KEY, XLS, XLSX, PPT, PPTX, HTML, HTM, CWK, INDD, EPS, VSD, ODT, ODS, ODP, ODG, ODF, RTF, etc. EML, EMLX, PST, MSG, DBX, EDB, BKL, BMS, BKS, etc. RAR, ZIP, BZip2, SIT, SITX, SYS, 7z, 7ZIP, LIB, DLL, GZIP, etc. Note: You can recover a maximum of 100 MB of data in demo version.